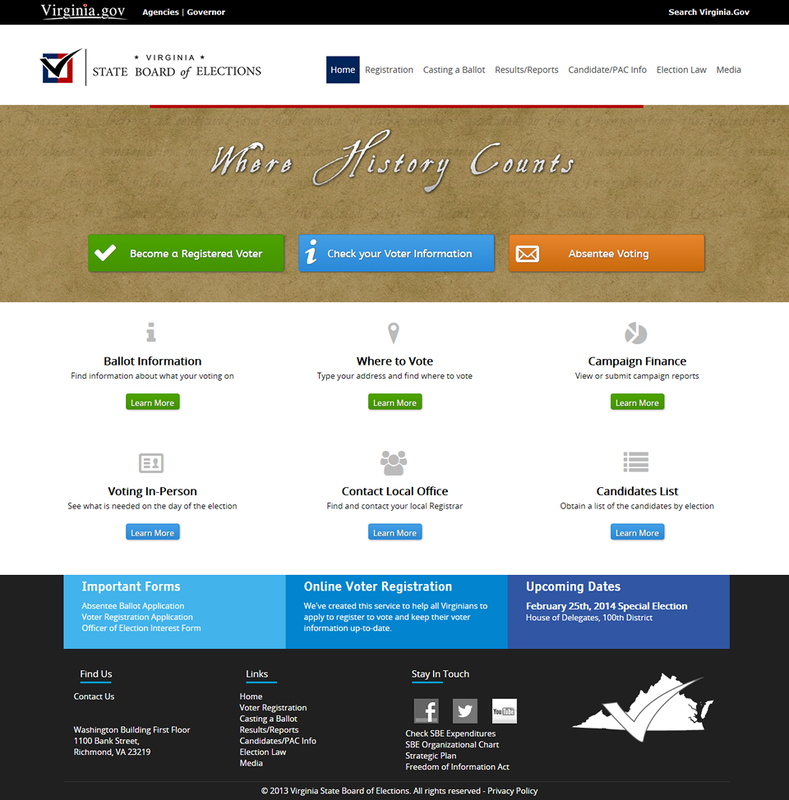 In 2012 I was contracted by the Virginia State Board of Elections (SBE) to update their website for the November 2012 Elections. Their previous iteration of the design had several major flaws such as the use of animated gifs, generic clip art, improper HTML coding, and out-dated table layouts. The website also had a disorganized taxonomy that was so confounding that it required the search bar to find most content. My responsibilities expanded after the release of the website to help design elements intended for social media and to help manage the social media sites of SBE for the November election. After the November election my contract was extended to help redesign forms and other items within SBE including a new web design built in WordPress. In addition I re-branded the agency with a new logo, styleguide, and tagline. The 2014 re-design of the SBE website features a responsive design for mobile devices and SVG logos. My primary focus was create a government website that was extremely usable. Keeping that in mind I essentially made the front page a giant menu of the top items that users search for (gathered via website analytics) on the SBE website. SBE was renamed to the Department of Elections in mid 2013 and the full re-branding became effective on that date.